Babette Bohn and Robert R. Coleman. The Art of Disegno: Italian Prints and Drawings from the Georgia Museum of Art. Georgia Museum of Art, Athens, Georgia, May 14–August 7, 2011. Jeanne Brasile. Intuitive Realities: Working Space 11. Cuchifritos Gallery and Project Space, New York, July 2–July 31, 2011. Nathalie Campbell. Heat Island. Smack Mellon, Brooklyn, New York, June 18–July 31, 2011. Anne-Marie Eze. Illuminating the Serenissima: Books of the Republic of Venice. Isabella Stewart Gardener Museum, Boston, Massachusetts, May 3–June 19, 2011. Sandra Q. Firmin. Artpark: 1974–1984. University at Buffalo Art Gallery, Center for the Arts, State University of New York, Buffalo, New York, September 25–December 18, 2010. Alia Nour and J. David Farmer. Reconnecting East and West: Islamic Ornament in Nineteenth-Century Works from the Dahesh Museum of Art and Syracuse University. Dubai Community Theater and Arts Centre, Mall of the Emirates, Dubai, United Arab Emirates, June 18–July 18, 2011. Nada Shabout. Interventions: A Dialogue between the Modern and the Contemporary. Al-Riqaw Art Space, Doha, Qatar, December 30, 2010–May 28, 2011. Nada Shabout and Wassan al-Khudhairi. Sajjil: A Century of Modern Art. Arab Museum of Modern Art, Doha, Qatar, December 30, 2010–October 1, 2011. Rachel Sloan. Drawn to Modernism: Selected Gifts from Wright S. Ludington. Santa Barbara Museum of Art, Santa Barbara, California, April 16–July 24, 2011. Edith Balas. Bird in Flight: Memoir of a Survivor and Scholar (Pittsburgh, PA: Carnegie Mellon University Press, 2011). Francesca G. Bewer. A Laboratory for Art: Harvard’s Fogg Museum and the Emergence of Conservation in America, 1900–1950 (Cambridge, MA: Harvard Art Museums, 2010). Kathryn Brush, ed. Mapping Medievalism at the Canadian Frontier (London, ON: Museum London and the McIntosh Gallery, University of Western Ontario, 2010). Kathleen K. Desmond. Ideas about Art (Malden, MA: Wiley-Blackwell, 2011). Sandra Q. Firmin. Artpark: 1974–1984 (New York: Princeton Architectural Press, 2010). Dale Allen Gyure. Frank Lloyd Wright’s Florida Southern College (Gainesville: University Press of Florida, 2010). Dale Allen Gyure. The Chicago Schoolhouse: High School Architecture and Educational Reform, 1856–2006 (Chicago: Center for American Places, Columbia College Chicago Press, 2011). Andrew D. Hottle. June Blum: Black and White Paintings, 1963 through 2010 (Cocoa Beach, FL: Blue Note Publications, 2011). Li Zhiyan, Virginia L. Bower, and He Li, ed. Chinese Ceramics from the Paleolithic Period through the Qing Dynasty (New Haven, CT: Yale University Press, 2010). Laurette E. McCarthy. Walter Pach (1883–1958): The Armory Show and the Untold Story of Modern Art in America (University Park: Pennsylvania State University Press, 2011). Richard Minsky. The Book Art of Richard Minsky (New York: George Braziller, 2011). Judith W. Page and Elise L. Smith. Women, Literature, and the Domesticated Landscape: England’s Disciples of Flora, 1780–1870 (New York: Cambridge University Press, 2011). Aimée Brown Price. Pierre Puvis de Chavannes, vol. 1, The Artist and His Art (New Haven, CT: Yale University Press, 2010). Tanya Sheehan. Doctored: The Medicine of Photography in Nineteenth Century America (University Park: Pennsylvania State University Press, 2011). Nino Zchomelidse and Giovanni Freni. Meaning in Motion: The Semantics of Movement in Medieval Art (Princeton, NJ: Princeton University Press, 2011). 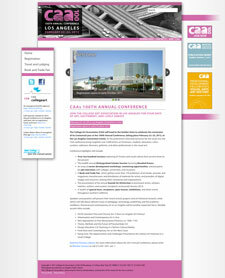 The Exhibitor and Advertiser Prospectus for the 2012 Annual Conference in Los Angeles, California, is now available for download. Featuring essential details for participation in the Book and Trade Fair, the booklet also contains options for sponsorship opportunities and advertisements in conference publications and on the conference website. 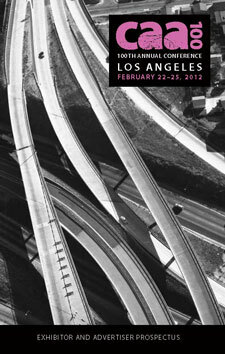 The Exhibitor and Advertiser Prospectus will help you reach a core audience of artists, art historians, educators, students, and administrators, who will converge in Los Angeles for CAA’s 100th Annual Conference and Centennial Celebration, taking place February 22–25, 2012. With three days of exhibit time, the Book and Trade Fair will be centrally located in the Los Angeles Convention Center, where most programs sessions and special events take place. CAA offers several options for booths and tables that can help you to connect in person with conference attendees. In addition, sponsorship packages will allow you to maintain a high profile throughout the conference. Companies, organizations, and publishers may choose one of three packages, sponsor specific areas and events such as Convocation, ARTspace, and the Distinguished Scholar Session, or work with CAA staff to design a custom visibility package. Advertising possibilities include the Conference Program, distributed to over five thousand registrants, and the conference website, seen by thousands more. The priority deadline for Book and Trade Fair applications is Friday, October 28, 2011; the final deadline for all applications and full payments, and for sponsorships and advertisements in the Conference Program, is Friday, December 9, 2011. Questions about the 2012 Book and Trade Fair? Please contact Paul Skiff, CAA assistant director for Annual Conference, at 212-392-4412. For sponsorship and advertising queries, speak to Helen Bayer, CAA marketing and communications associate, at 212-392-4426. 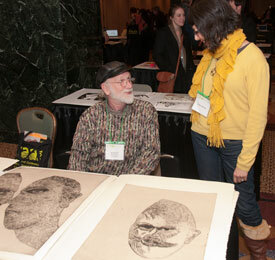 CAA’s Services to Artists Committee invites artist members to participate in ARTexchange, an open forum for sharing work at the 2012 Annual Conference. Free and open to the public, ARTexchange will be held on Friday, February 24, 5:30–7:30 PM, in a central location at the Los Angeles Convention Center. A cash bar will be available. Participants are responsible for their work; CAA is not liable for losses or damages. Sale of work is not permitted. Participants may not hang artworks on walls or run power cords from laptops or other electronic devices to outlets—bring fully charged batteries. For the first time, CAA will provide wireless internet to ARTexchange participants free of charge.